Syiane is using Smore newsletters to spread the word online. These animals have had to learn to live in their hot homes. Prairie dogs' eyes are at the sides of their heads, they use them for detecting movement over a wide amount of area; this helps detect a predator faster. Prairie dogs don't need much water to live, they get all their water from the plants they eat. Thier sand/dirt colored bodies help them blend in with the dirt and grass. They bark to warn other dogs of nearby predators, scream in pain to alert others, and a rasping sound that warns of an attack. this helps the coterie (group of prairie dogs) prepare for an attack so less die. Prairie dogs also build homes underground. The tunnels prevent flooding because of the angle they are built at. They mainly eat plants since they live in an area that consists of lots of plants. There are black-tailed, white-tailed, and many more types of prairie dogs. It's better to be a black-tailed prairie dogs because the tail blends in with the environment, whereas the white-tailed prairie dog sticks out like a sore thumb. Their diet consists of: grasses, sedges, forbs (flowering plants), roots and seeds, they also eat insects. They are known to live in grassy plains. Most prairie dogs hibernate during the winter. The mating season is March. 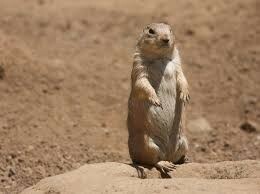 They are called prairie dogs because Texas settlers thought that their barks sounded like a dog.